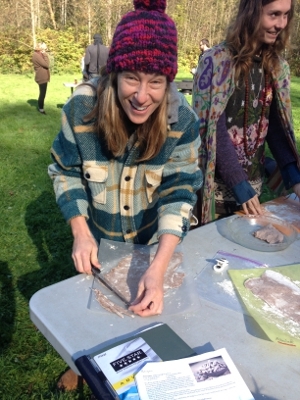 Ethnobotany and mushrooms took center stage in Week 5 of the Wilderness Certification Program with cattail basket making, fall wild edible plant harvesting, and mushroom identification and foraging! 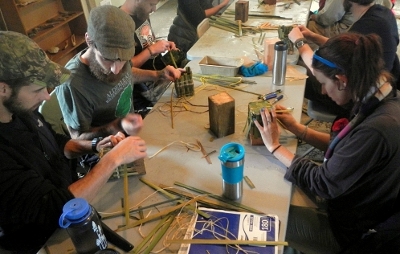 Early in the week, students learned to make plaited baskets using wild harvested cattail and rafia. Traditionally, Native Americans from the Pacific Northwest used cedar bark, cedar root and spruce root, but since our class sizes were fairly large, we decided to ethically harvest more abundant resources such as cattail. Each student went home with a basket that they made themselves. 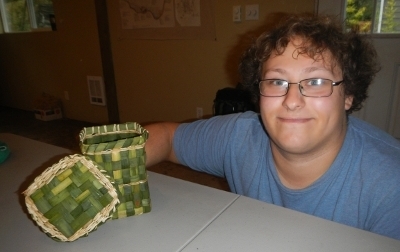 Here Certification Program student, Aaron, displays two of the baskets that he finished during class. On Wednesday the class learned how to identify both edible and poisonous native plants. Sent out into the woods, the students returned with a myriad of wild edibles which they in turn prepared into dishes such as chickweed and dandelion pesto, acorn pasta and a wild soup made with sheep sorrel, lamb's quarter and acorns. Certification Program student, Brooke, is cutting the dough for the acorn pasta. 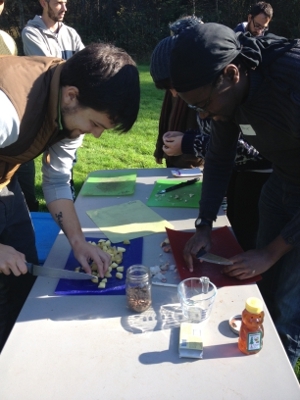 Students David and Patrick are helping prepare the acorn soup made with native wild greens. To cap off the week (no pun intended), instructor Fil took the class out on a wild mushroom foraging hunt in the back 10 acres of the Alderleaf property and returned with a fairly large bounty of edibles including chantrelle and lobster mushrooms and even some medicinal (anti-cancer) mushrooms such as turkey tail conks. Here students proudly display their mushroom bounty after the forage. Notice they used their cattail baskets that they made earlier in the week to do the gathering. 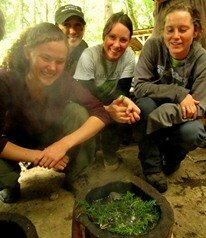 Later that evening, the students got together and prepared a feast of wild edible plants and mushroom. 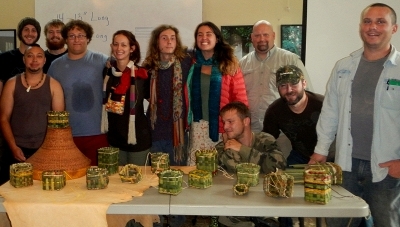 It was a great week for the Wilderness Certification Program students. Learn about the Alderleaf Wilderness Certification Program, our in-depth, nine-month course that trains students to teach and apply wilderness survival, permaculture, ethnobotany, wildlife tracking, naturalist, and outdoor leadership skills.